I've been a military spouse for my entire adult life. I think one of the most difficult things a military family faces is the long deployments whether it's for tours overseas, training courses or humanitarian missions. I'd like to say that I got used to my spouse being away for extended periods of times and the reality of being called out on very little notice, but it was hard for me each and every time. Of course, I understood it was all part of the job and what I signed up for when I married a man in the military, but it doesn't mean that it didn't make me sad when he left. The first couple days of a deployment were always the most stressful as I dealt with adapting to being a single parent again and worrying about his well-being. One thing I did each time he was away is do a countdown till his return. I'd put a calendar on the fridge and cross days off as time passed. It gave me something to look forward to and the kids could see how long it would be till their daddy was home again. I can relate to having a loved one away over the holidays and it's tough. Thankfully I was lucky and it hasn't happened too often, but when it did I tried to keep myself as busy as possible. I was grateful for my girls and family to keep my mind off the fact that my spouse was missing Christmas. I think what I missed most about not having him there was the fact that he wouldn't see the delight on our daughters' faces as they opened up their presents. I always made sure to take lots of photos so he could share in their joy after the fact. I think one of the best things a person can do for a military family who has a loved one deployed is to just show them that you are there for them. Give them a call just to chat or invite them over for a visit. It meant the world to me to know that I had a good support system in place and a listening ear to vent my frustrations about how I was missing my husband. Friends and family can definitely make the time pass much quicker! Today I wanted to share another awesome way you can help a military family this holiday season. 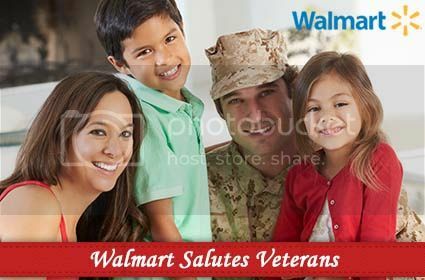 Walmart, Operation Homefront and Fisher House have teamed up together to support military families across the USA. It's called Walmart's Holiday Salute to Military Families and its goal is not only to honor past and present military members, but also to offer support ot military families who are the heroes at home. With $2 million in grant money, the program will provide toys, lodging and meals to military families in need of some extra support. Plus, it will also help hundreds of active duty service members to be reunited with their families over the holidays. I know that would be the best present ever for me! If you are looking for ways to help the military community this holiday season, I invite you to check out Fisher House and Operation Homefront. They are also planning a nationwide salute by all Americans. Join in our Holiday Salute to Military Families and please share this post and maybe even tag a military member you are grateful for. Also, mark December 3rd on your calendar. It's Giving Tuesday and a day you can give back and support a worthy cause. The Holiday Salute to Military Families is the perfect way to do just that! God bless your husband, your family, and the other military families out there. I can’t imagine having my husband deployed. Know that you are thought about and prayed for. We make it a point to help out the military and to pray for them and their families. I love these ideas and that big corporations are spreading the word and helping. We all need to know we are thought about and loved. Military men, women, and families especially. Thank you. I didn’t know your husband was in the military. That must be hard. I have a friend whose husband is also in the military, they have a young son. Its amazing what they are doing for our country. This campaign that Walmart is doing is so great!! Sharing! I love the campaign that Walmart is doing.I know the stress and anxiety a mother can feel as I have had two of my sons overseas at the same time.I can only imagine how you as a wife would feel too.God Bless. Thanks for the reminder to think about military families this holiday season! I am so glad to see Walmart doing this, another reason why they are a great company! I had two of my boys join the marines together shortly after they graduated high school. While stationed in SC and VA they both met the love of their lives and started families of their own. My hat goes out to your family this Christmas and all the other families that sacrifice while their loved ones are away and the challenges that they may face when they return home. Many prayers to ALL! As a military Family I can tell you that the holidays are the best and worst. If your family is whole it is fantastic but if not it is sad. Thanks so much for supporting the families out there. God Bless your husband for everything he does for the Military. God Bless you and your children for bearing the burden of not having him present during the holidays and birthdays. I can not imagine how many sleepless nights you have endured being a single parent during this time while he is away. It takes special people to handle what you are all going through. Best of Love, Health, Happiness today, during the holidays and always God Bless you all!